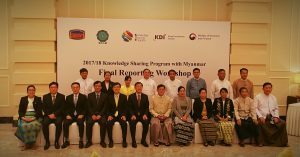 The “2017/2018 Knowledge Sharing Program with Myanmar Final Reporting Workshop” organized by the Securities and Exchange Commission of Myanmar (SECM) and Korea Development Institute (KDI) was held for capital market development in Myanmar at Hilton Hotel, Naypyitaw, Myanmar on 24th August, 2018. U Maung Maung Win, Deputy Minister of Planning and Finance as well as a Chairman of SECM, Daw Khin San Hlaing, Chairwoman of Banks and Financial Affairs Development Committee of Pyithu Hluttaw , members of SECM, heads of departments under the Ministry of Planning and Finance, officials and representatives from Ministry of Foreign Affairs, Ministry of Construction, Union Attorney General’s Office, Central Bank of Myanmar(CBM), Yangon Stock Exchange (YSX), Listed Companies and Myanmar Development Institute (MDI) from Myanmar side and Dr. Young-Kwa KIM, Senior Advisor of Knowledge Sharing Program (KSP), Dr. Chang Jae LEE, KSP Project Manager, Experts from Korea, Dr. Choong Lyol LEE, Dr. Kun-Ho LEE, Dr. Sekyung OH and Officials of KDI from Korea side attended to this workshop. In this workshop, the experts of Korea (KSP Team) and three local consultants of Myanmar (2 from SECM and 1 from YSX) shared their knowledge and discussed about “to establish the corporate bond market in Myanmar”, “to enhance supervision of the securities industries in Myanmar” and “to increase listed companies in the Yangon Stock Exchange” for capital market development in Myanmar. In addition, they also shared and discussed about their experiences, difficulties and challenges when Korea’s capital market was founded. Taking lessons of Korea’s experiences and concerned with policy recommendations to develop Myanmar’s capital market and comments of the experts attended this workshop from several sectors will be disclosed in the final report.